With the crop reaching its height, it is time for my annual paean to sun-warmed, vine-ripened, local tomatoes. These beauties are delicious sliced with a little salt and olive oil. However, if you want to add a little variety without too much fuss, one of my favorite ways is to chop up a few tomatoes and season them to spoon on top of bruschetta. What exactly is bruschetta? The name comes from abbrustolito, Italian for toasted. In its most fundamental form, bruschetta is a slice of grilled bread rubbed with garlic and drizzled with olive oil. 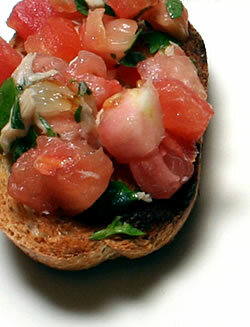 In Tuscany, this basic bruschetta has its own name, fettunta, which translates as oiled slice. We use the words bruschetta and crostini interchangeably but Italians know there are particular differences. Bruschetta is a grilled slice of crusty, rustic bread. Originally a way to use up stale bread, it may be so hard before grilling that it requires moistening with water. This allows the bread to absorb any juices when a topping is added. Crostini are not necessarily grilled. They may be toasted or pan-fried. Some Italians specify that crostini should be made using white bread and bruschetta a coarser loaf, perhaps even sourdough. Toppings for crostini are more refined or complex, like sauteed chicken livers or Swiss chard sauteed with garlic and topped with pungent pecorino cheese. Although you can buy a tomato topping to make bruschetta, skip the premium price and chop your own tomatoes and garlic and add fresh basil and oil. I like including balsamic vinegar, too. Mix in canned tuna and parsley and heap generously onto a slice of whole-grain Italian bread to make a little meal on a portable plate. Finding whole-wheat Italian bread is worth the effort. It is more nutritious and its texture holds the tomato juices better, making a more succulent bruschetta. Makes 4 light meal servings as, 8 antipasto servings. Place tomatoes in colander set over bowl. Add salt and mix to distribute it evenly. Let tomatoes drain for 10 minutes. Pressing gently with your hands, extract most of remaining moisture. Turn drained tomatoes into mixing bowl; there should be about 2 cups. Finely chop 2 garlic cloves. Peel and halve remaining clove and set aside. Meanwhile, heat oil in small skillet over medium-high heat. Add onions and chopped garlic and saute until onion is pale gold and garlic just starts to color, 4 minutes. Add onions and garlic to drained tomatoes. Mix the vinegar and parsley into tomatoes. 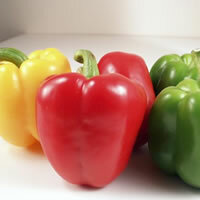 If tomatoes are not fully ripe or taste acid, add sugar. If using, mix in tuna. Season tomato mixture to taste with pepper. Toast or grill bread. Rub one side of warm bread with cut side of remaining garlic clove. Just before serving, mix basil into tomatoes. Packing tomato mixture into tablespoon measure, mound it on bread, using 2 tablespoons for each bruschetta.